« You Have 5 Seconds to Make an Impression! Earlier this year I published a blog post entitled “My Significant Drop in Use of JISCMail Lists” which described how the numbers of messages I have published to the web-support JISCMail list has dropped from a peak on 53 in 2001 to only two messages in 2009. I speculated that such a steep decline was true more generally in many of the JISCMail lists I subscribe to – but was unable to easily provide evidence due to the resource effort in having to manually count the numbers of posts to the lists. Following the recent upgrade to the JISCMail Web site searches across JISCMail archives now include the total numbers of matching search queries. So carrying out a search of JISCMail archives for author’s addresses which contain ‘@’ for each year should enable trends to be observed. 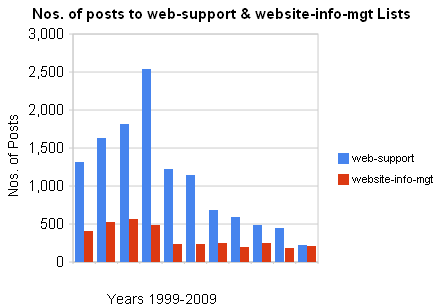 The results for the numbers of posts to the web-support and website-info-mgt JISCMail list between 1999 and 2009 are shown. The peak for the web-support list was 2002 when 2,540 messages were posted. The website-info-mgt list had a peak of 568 messages posted in 2001. The decline of both of these lists now appears to have stabilised at just over 200 messages posted per year (less than 5 messages per week). Many of these messages will related to announcements of events, job vacancies, etc. rather than the discussions which took place in the early days of these lists. Clear evidence, it would appear, of the decline in importance of mailing lists over the past 5 years, replaced, we would imagine, by use of a variety of Social Web tools. The Web Management community is now, perhaps, a blogging, twittering and social bookmarking community. But how have other popular JISCMail lists used by other communities changed over the past 10 years? In the case of the lis-link JISCMail list it seems that the Library community still makes intensive use of mailing lists. Over the same time span this list was mostly widely used at the start of the period, with 3,651 posts in 1999. The decline since then has, however, been relatively slight with 2,226 posts in 2008 (and a rise t0 2,401 posts in 2009). Whilst the institutional Web management community has moved away from JISCMail, those working in the library sector are still making intensive use of the service, receiving, on average, 46 messages per week on this list. And since there are a number of more specialist JISCMail lists aimed at the Library community (including LIS-CIGS, LIS-E-BOOKS, LIS-E-RESOURCES, LIS-ILL and LIS-Web2) it is quite clear that mailing lists still provide an important service for this community. Unfortunately the JISCMail search facility does not provide a RESTful interface so I can’t provide a link to the data used to produce the graphs shown above. However Google Spreadsheets was used to produce the graphs and this has been made publicly available. “Email Must Die!” was the deliberately provocative title of a talk I gave at the ILI conference back in 2005 (and having noticed that the iPres 2010 call for proposals requests that “Panels should be lively, controversial and provoke discussion” I am unapologetic in being prepared to occasionally use somewhat controversial titles for my talks). A report on the talk (available in PDF format) described how I introduced a “whole plethora of alternative methods of communicating information that enable collaboration or that provide information to the gadgets or programs that people use in real life, such as RSS feeds from blogs, instant messaging, wikis, podcasts, and so on” and argued that “it won’t be too long before our users will expect libraries to be able to communicate using these channels, so we’d be well advised to explore them now!“. This prediction seems to have come true amongst Web managers, with the main mailing lists used by the community seemingly being used for one-way announcements rather than discussions and debates. But in other communities this hasn’t happened. Why is this, I wonder? My initial suspicion was simply the lag in the adoption of new technologies, with the early adopters having embraced various Web 2.0 communications technologies a number of years ago to be followed by mainstream users. In this spectrum we might expect those primarily involved in Web support and development work to be part of the early adopter community, with those who have a prime focus on other areas (teaching and learning and research, for example) to be somewhat behind in making use of new technologies. But does such a technological deterministic really reflect reality? There will be additional factors such as ease of access to networked computers and access to Web 2.0 services themselves – and many of the librarians on the LIS- lists who work in FE colleges, public libraries and, indeed, the commercial sector, may not have the ready access to the services which many of us working in HE have now come to expect. There is also the question of whether users need to migrate to new technologies if well-established approaches, such as email lists, fulfill their purposes. 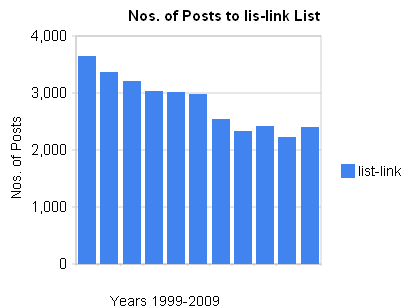 On the other hand, revisiting my post on “Decommissioning / Mothballing Mailing Lists” the trends showing the numbers of messages posted to lists seem to clearly indicate the majority of lists no longer have any traffic and those with over 100 messages posted per year (such as the LIS-LINK) are very much in a minority. Does this evidence (taken from the JISC Monitoring Unit Web site) suggest that the library sector are out of synch with the rest of the community?? This entry was posted on 4 Jun 2010 at 9:00 am	and is filed under Evidence, General. Tagged: JISCMail. You can follow any responses to this entry through the RSS 2.0 feed. You can leave a response, or trackback from your own site. You’ve posted this just as I am mulling over what we quite do with some of the feedback we’ve got through market research for some of our services. If some of this feedback is correct, then I’d say that the library community is much more in synch with the research community in its use of email as a communications channel than ‘we’ are (whoever that ‘we’ is). When we surveyed Zetoc users, email overwhelmingly outnumbered RSS as the preferred means of delivering research updates. When we recently did focus groups with new postgrads *very* few used personalisation tools & could not see the value (not immediately). Again, they said they would prefer email. So who’s out of synch? It would be tempting to just cast these people as unenlightened and stuck in the past, but I don’t think so. I’m not advocating email as *the* most effective means to communicate & share ideas, or any for that matter, but I think we need to be careful about casting it as some sort of old fashioned and ‘non-interactive’ mode of communicating. I can be a passive consumer of twitter or a blog just as much as any other medium, and be ‘interactive’ with email. It depends on the context. Email is probably the most single important technology I use on a day-to-day basis. It’s utterly embedded. Diminishing trends highlight what you’ve said — that conversation is also happening elsewhere. But email still dominates for most, and I suspect for a long time. Hi Joy. Thanks for the comment – and it is good to have some evidence to inform such discussions. I note that you said that “email overwhelmingly outnumbered RSS as the preferred means of delivering research updates“. The context of my post was use of mailing lists to support discussions within communities. So I don’t think we are necessarily in disagreement – I don’t think anyone is suggesting that JISCMail lists should be used for delivering research updates from services such as Zetoc. Personally, I wonder if these numbers will rise slightly when Universities move to Outlook 2010 and have conversation view, making email lists look a lot more organised and more like RSS feeds. Google wave seems to occupy a middle ground between email and some of the other forms of communication/collaboration out there. Fresh and ground-breaking as it is, I am surprised that it has not made more of an impact than it has so far. ‘the majority of lists no longer have any traffic’. I think it’s the way of many email lists to have a natural life-cycle ending with dormancy. JISCMail has been going for 10 years; when it took over from Mailbase, only currently active lists would have been transferred to it, so since then you would expect the proportion of dormant lists to have risen. Hello, I am writing a paper on the use and relevance of my jiscmail list zooarch (a list concerned with the study of animals in the past) that has been running for 11 years now and has steadily increased in membership and messages but not in direct proportion. We are seeing a number of changes in message types which I attribute to changes in technology, e.g. pdfs not photocopies and the treasure trove that is our archive also the list now is so large (about 1000 folk from 45 countries) that people do not want to ask ‘stupid questions’ anymore. I am interested in any other parallel changes on other lists. Has anyone else reviewed their lists and their usage? We do have a breakaway facebook style group for younger folk this is minorly sucessful, but no one uses RSS to my knowledge. I have stats about messages versus members if anyone is interested.